Trials Evolution is the highly anticipated sequel to the hit game Trials HD. But is the latest instalment in the Trials series worth buying, or will it just make you motor-cross? For Trials Evolution the games developers, Red Lynx decided to stick with what they know works, and in this case that isn’t necessarily a bad thing. 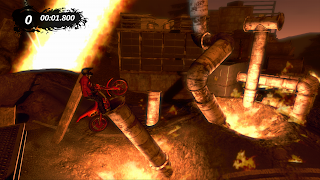 Trials follow its usual physics based motorbike obstacle course format with challenges ranging from easy to the extreme tracks, meaning fans of Trials HD will feel right at home and be able to jump straight into the game. The addition of the numerous license tutorials that players must play through in order to continue also better educate those new to the series with the skills they require for the increasing difficulty and the obstacles that await in later tracks. Trials also keeps the traditional live leaderboard in which players can see their friends progress on the tracks as they play. This gives the game a more competitive feel, as there’s nothing worse than seeing a friend or rival pass the obstacle you’re having trouble on. Tournaments are also included in single player to test the player’s speed and skill across a number of tracks where the time and amount of faults is carried across from each track. 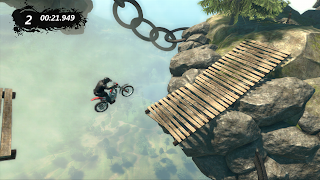 Trials Evolution also has a number of different challenges separate to the regular motorbike experience. This could include skiing around a track and doing as many flips as possible or guiding a UFO to different landing pads. Even though the mini games are different from the actual game they are easy to pick up, yet hard to master. The inclusion of Track Central also means that players can make their own tracks, which can be saved and uploaded to the Track Central database for other players to play, rate and save themselves. Track Central has two different modes. 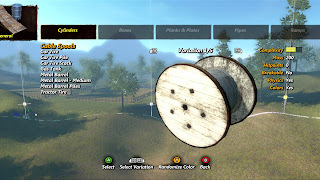 Lite editor, for players who just want to place objects and other simple actions and Pro editor, which allows more experienced players to tweak almost every detail of their track including adding trigger events and other details such as stopping the player from using the brakes on their bike. This promises to give a wide variety of different tracks from different players from around the world. I played though a number of user created tracks which were really imaginative and challenging. Let's see them get past this haha! It’s hard to fault Trials Evolutions gameplay as it is based on a sound formula, which proved popular in Trials HD. The only slight issue with the gameplay is that it is literally the same. Although it has a number of new additions that attempt to keep the game fresh, fans hoping for something new may be a tad disappointed. The game’s visuals are a definite improvement on Trials HD’s already gorgeous presentation. Trials Evolution has lots of different tracks set in different areas of the Trials world map which guarantee that hardly any of the tracks you come across will have a similar backdrop or environment. Trials Evolution also has a number of tracks that pay homage to other games or films. In particular the Limbo inspired level is interesting as well as the mind bending Inception level in which the world spins and the player must fight against the ever-changing physics, environments and backdrops. Although it’s not without its issues. On a number of occasions I have encountered random textures popping throughout levels as well as some minor screen tear. The screen tear is particularly noticeable when playing online as opposed to single player. Although neither of these have that much of an impact on the gameplay itself. Is it me? Or is it a little too hot here? The Online Multiplayer for Trials Evolution is a welcome addition to an already great game. Multiplayer can be played online or with up to 4 players on the same console. Multiplayer can be played in two different styles of play. The first is Trials mode in which you must race against players live ghosts through the single player Trials tracks. The second multiplayer mode is Super-cross. This has players race across a track as fast as they can; however you are all on screen at the same time just in different lanes. Players can also choose to queue tracks up from both Trials mode and Super-cross mode for a longer tournament. The online gameplay is smooth and although matchmaking sometimes takes a while, once the action starts its fun, intense and hard to put down. With an addictive online multiplayer, an in-depth track editor and a challenging single player campaign, Trials Evolution is a welcome addition to the Trials family. Despite its minor graphical hiccups it is definitely worth a purchase and will keep you entertained for months to come.